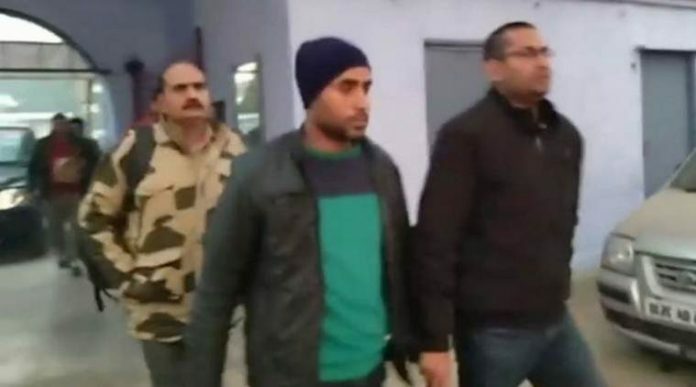 Army jawan Jeetendra Malik, who was arrested for his alleged involvement in the killing of police inspector Subodh Kumar Singh in Bulandshahr earlier this week, was sent to judicial custody for 14 days by a local court on Sunday, news agency ANI reported. Jeetendra alias Jeetu Fauji’s role in the mob violence in Siyana village of Bulandshahr last Monday, which claimed the lives of inspector Singh and a civilian, Sumit, surfaced after a purported video showed him allegedly opening fire. The violence broke out after cattle carcasses were found in the nearby fields. The main accused in the case, Bajrang Dal activist Yogesh Raj, is still on the run. ADG (Law and Order) Anand Kumar had said that a police team was sent to Jammu and Kashmir, where Malik was posted, and that the “person in the video is Malik”. While he was detained by his Army unit on Friday, he was arrested by the Uttar Pradesh police on Saturday. “We have arrested Jeetendra Malik and he was handed over by the Army at 12.50 a.m today. Preliminary interrogation has been done. He is being sent to Bulandshahr and will be produced before the court for judicial custody,” senior police officer Abhishek Singh had earlier told ANI.